Army quarterback Angel Santiago didn’t start the game, but he’s hoping to create an improbable finish. The junior hit freshman Xavier Moss with a 29-yard strike about midway through the third quarter, then followed it with a 4-yard scoring run to give the Black Knights life. Navy answered with a clock-eating 11-play drive and a 34-yard Nick Sloan field goal to make it 20-7 at the end of three quarters. 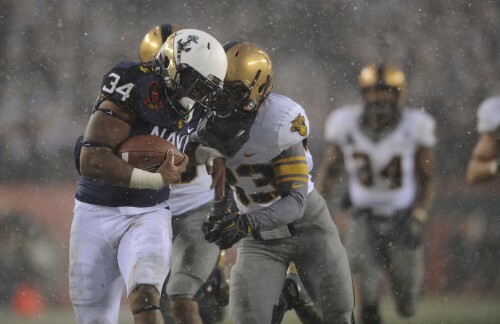 If Santiago and Army continue to put the ball in the air, Navy may need some more heroics from freshman cornerback Brendon Clements, who has already forced a fumble and snared an interception. Passing remains a novelty for both sides: Santiago had five completions on nine attempts for 50 yards after three quarters, while Navy’s Keenan Reynolds was 2-for-6 for 10 yards.